Like Windows operating system, Apple also started to update its operating system for MacOS sierra. But many MacOS user thinks that they won’t able to get back to the previous version after updating MacOS system. Users can bootable installer it’s like and an operating system CD which can be used with Mac anytime. You can use this CD as dual software installation making hard drive partition. You can also use as a bootable drive if cannot use the internet recovery partition. If you don’t like the newer version, you can use it to downgrade to your older version. Before getting started you should take backup of your Mac. You should have 8 GB of storage or an external hard drive. You will also need to download MacOS Sierra from Mac App store. How to Format your External Drive for MacOS Sierra? How to Make your External Drive into macOS Sierra Boot Drive? How to use macOS Sierra with a bootable drive? Step 1: Plug in your external drive in Mac. Step 2: Click on Finder on a dock to open a finder window. Step 3: Select application from the list on left side of the window. Step 4: Scroll down and double clicks on Utilities. Step 5: Then Scroll down and double click on Disc Utility. Step 6: Choose your external drive mention under external on left side of the window. Step 7: Click on Erase tab at top of the window. Step 8: Remember your drive name you will need it while creating a bootable drive. If you have a drive with the same name, then you have to rename it. Step 9: Select Mac OS Extended from the format list. Step 10: Click on Erase. Step 11: Once progress is completed. Tap on Done. Step 12: Close Disk Utility window. Your External Hard Drive is now ready. To create a boot drive, you will need to use an Administrator account on your Mac in order to run terminal commands. Step 1: Click on Finder from the dock to open Finder Window. Step 2: Select applications from the list from the left side of the window. Step 3: Scroll down and click on utilities. Step 4: Scroll and Double click on the terminal. Step 5: Recall the name of your formatted external drive when typing the below-mentioned text into Terminal. If it is not named “Untitled,” you need to change the command syntax for the pathname where it says: Volumes/Untitled. The name of the drive is case sensitive and it can’t have any spaces. Step 7: Hit the Enter Key. Step 8: Enter your Admin account password when you log in. After entering the password, nothing will appear on the screen. Once the process is completed. The terminal window will report” Done”. You can boot up any Mac with the drive plugged. Once MacOS Sierra is Installed on your external drive. 1) Turn off Mac you want to use macOS Sierra with the bootable drive. 2) Connect the drive to Mac with USB port. 3) Turn on your Mac. 4) Hold On Alt key till you listen to the sound of start chime. 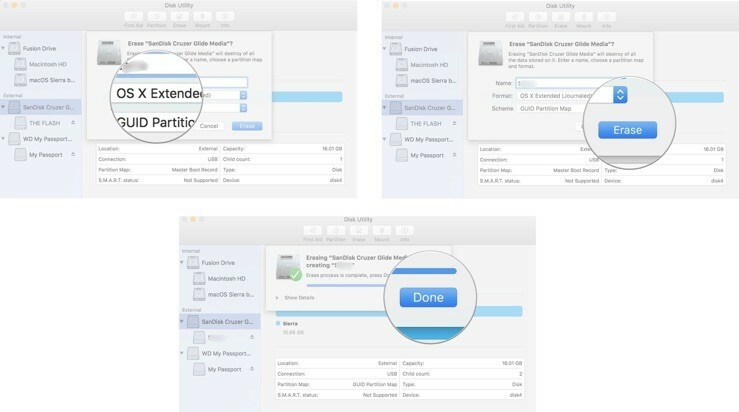 5) Select the external drive with MacOS Sierra on it from the list of systems to start your computer. Previous Article How to Setup and Customize Apple Music User Profile in iOS 11? Next Article How to get Refunds in iTunes App Store?